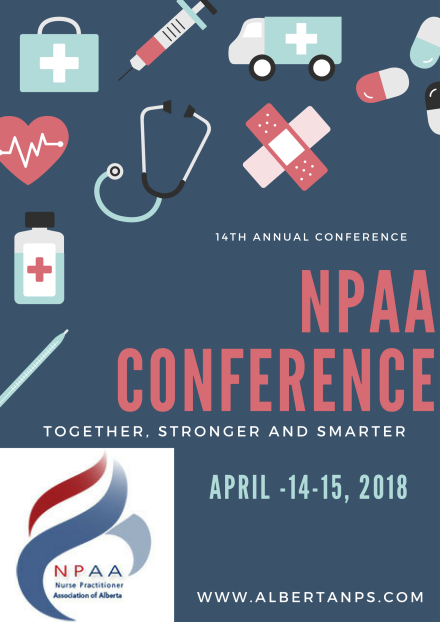 The Nurse Practitioner Association of Alberta (NPAA) is excited to be hosting the 14th Annual Nurse Practitioner Conference in the heart of Downtown Edmonton at the Sutton Hotel, April 14th and 15th, 2018. We are planning some exciting speakers with updates relevant to your practice. Included in our conference are specialists and NPs from across Canada including speakers from BS Medicine and Canadian Nurses Protective Society. Our conference will provide you an opportunity for professional growth, and to engage and network with colleagues from across Alberta and Canada. Late Registration. April 3rd and onward. All NPAA Conference attendees will be offered a discounted hotel rate of $139 per night. When scheduling your stay with Sutton Place indicate that you are attending the NPAA Conference to obtain our discounted rate. NPAA membership is inclusive of NPs provincially and nationally and helps NPs keep in touch with updates in the NP field. As well, there are many who are interested in the NPAA who are from other disciplines and obtain an associate membership. The benefits of membership are numerous some include: a 20% discount to the dermatology clinical support tool VisualDx, an UptoDate discount valued at $200, access to the member-only NPAA Forum and NPAA representative contacts. All for only $99. Please see the NPAA website for further information on NPAA Membership benefits and application process. Contact education@albertanps.com for conference related questions. Please contact education@albertanps.com for questions regarding 1 day conference registration.